St. Hildegard busy writing stuff down. 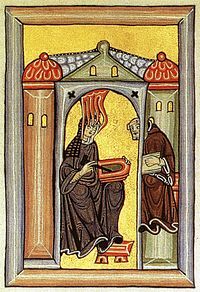 Hildegardian medicine is a system of humoristic alternative medicine created by St. Hildegard of Bingen (1098-1179). It is mostly based on visions Hildegard received from God. Hildegardian medicine is quite obscure and currently practiced only by some hundred alternative medicine practitioners, mostly in Germany and Switzerland, with less than ten in France. Hildegardian medicine focuses on making sure the humors are balanced through diet, herbal remedies (such as the carcinogenic birthworts), jewel therapy, detoxifying measures such as bloodletting (which is sometimes to be done before a full moon), cupping, fasting, saunas, and hot and cold showers. Strawberries, prunes, and leeks are considered toxic. Jewels (such as diamonds) can be placed on the skin or into water, which is to be drunk; this is supposed to be good for things like loss of vision, epilepsy, and heart pain. ↑ 1.0 1.1 1.2 1.3 Medical Miracle Worker, Chicago Tribune, March 01, 2000, Janet Kinosian. ↑ 2.0 2.1 St Hildegard's Medicine, Sebastian Liew Centre. ↑ Hildegard of Bingen Bloodletting and Theories of Cancer Metastasis, Ingrid Naiman. ↑ La médecine de sainte Hildegarde, Marie de Nazareth.